SailGP today announced its exclusive appointment of Captain Cook Cruises to deliver the official on-water fan experiences at the first ever SailGP Grand Prix in Sydney, February 2019. Last month, Sydney Harbour was unveiled as the curtain raiser for the inaugural SailGP competition, which will see six national teams compete in five grand prix events around the globe. The teams will race on the world’s fastest, most technologically advanced F50 catamarans, which can reach breathtaking speeds of up to 100 kilometres per hour. SailGP Sydney Official Spectator Boats will offer exceptional on-water experiences for adults and families, with the boats located in a preferred viewing position on the race area perimeter. There will also be live TV coverage on screens aboard each Official Spectator Boat. The SailGP Sydney Official Spectator Boats include Sydney 2000, Nancy Wake, Maggie Cat, Sydney Crystal and AUSPRO. 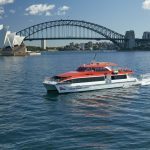 Spectators will be able to book Club Passes with food and premium beverages onboard the 206-foot Sydney 2000. 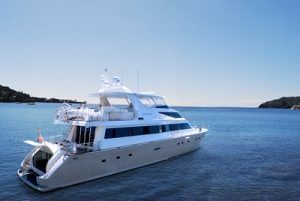 The vessel also boasts private rooms for those wishing to host a private group. Nancy Wake and Maggie Cat will both offer Fan Passes, with drinks available for purchase on-board. 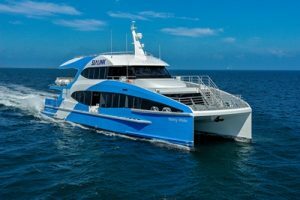 Finally, the 65-foot catamaran Sydney Crystal and 90-foot superyacht AUSPRO – with luxury bars, lounges and viewing decks – will be available as the exclusive SailGP Sydney Official Spectator Boat private charters, for a single private or corporate parties of 20-60 guests. VIP pre-sale tickets go on sale today (15 November) for people who have registered at SailGP.com/races/Sydney. VIP pre-sale tickets range from $57-$225. Early bird tickets will be on sale from 22 November at SailGP.com/Sydney.